Liam Hemsworth Talks Valentine's Day Plans and Independence Day: Resurgence—Will He Appear Shirtless? Liam Hemsworth Going Shirtless in "Independence Day"? Now that Liam Hemsworth and Miley Cyrus are back together, will he surprise her with a special Valentine's Day treat? The 26-year-old Australian hottie told E! News' Sibley Scoles exclusively Friday, more than a week before the holiday, that "sadly," he had not yet made any plans. "Maybe I'll make some though," he said. Hemsworth and Cyrus, 23, rekindled his romance more than a month ago, two years after they split and ended their engagement. Multiple sources told E! News in late January the two are again set to wed.
VIDEO: Miley Cyrus moving in with Liam Hemsworth? 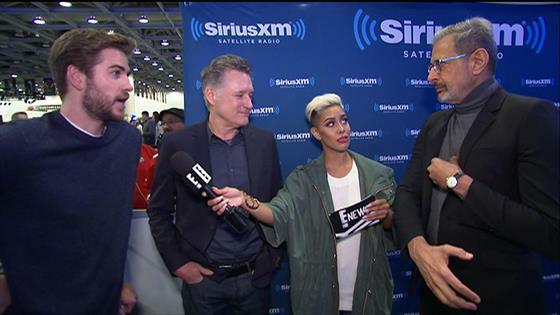 Hemsworth made his comments in a group interview with Independence Day: Resurgence, co-stars Jeff Goldblum, 63, and Bill Pullman, 62, who are reprising their roles in the upcoming sequel. Will Hemsworth, a franchise newcomer who is often admired for his washboard abs, appear shirtless in the movie? "I don't think so," he said. "I'm not really sure, I can't remember. I haven't seen the film so maybe they changed it or cut it out." Independence Day: Resurgence is set for release on June 24 and also stars returning cast members Judd Hirsch, 80, who plays Goldblum's character's father, Vivica A. Fox and Brent Spiner. Will Smith, one of the main stars of the original Independence Day, will not return, as his character met an untimely fate...offscreen. "He made a great sacrifice," Goldblum told Scoles.